Left foot forward (a journey into reenactment): BLING. Welcome to the order of the fried egg! Medals in the world of reenactment are a subject of debate and controversy. How does someone earn medals in battles that are usually loosely scripted and with a predetermined outcome? who decides if someone should have one? Well, no one really except the wearer. When I went to Jaywick prepared to be an Officer I decided to put one of my Waterloo medals on to 'Top brass' my uniform up a bit, it was still on there when I packed it for Ligny and I decided to keep it on, particularly as the ribbon is in Belgian colours, but did feel a bit iffy about it a couple of time. Historically most soldiers would only don medals and plumes and fancy bits and bobs for parades and dinners and such events. There is a school that feels you should not wear an historical medal unless you are actually entitled to it, and most medals I've seen are just for big events. Some people might frown at historically inaccurate (made up) medals, some people will frown at the opposite. 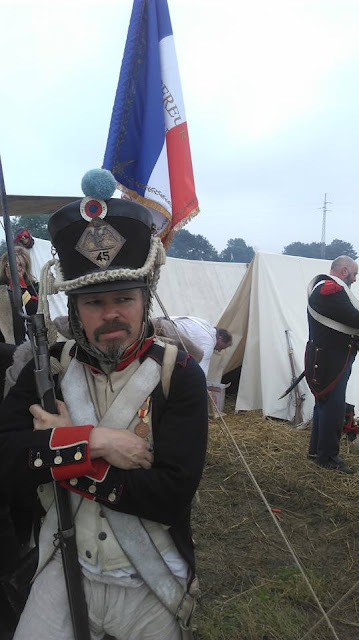 I mentioned a facebook thread I'd seen about a world war two reenactor (pictured below) to a friend at Ligny familiar with some other eras and he quite agreed, I hate to generalise but the worst offenders in Blingology seem to be WWII Germans.. 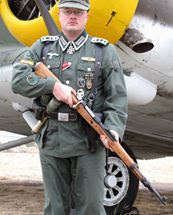 He has nearly every medal a German can get, including the Iron cross, first and second class I believe (I'm no expert) and to me the worse thing is.. if he has done so much to earn them.. why is he still a f*%king private soldier guarding a plane on some airforce base with a rifle? all that and not one promotion? In America many American civil war events give out medals for events, they can build up pretty quick! but again you would not normally wear them into battle at the time. I've also seen the odd person in a habit (jacket) with long service stripes who has borrowed or inherited the garment and not taken them off. I feel a bit iffy about that although those in immediate circles generally know the score. I have to say in Napoleonic circles people seem quite restrained, the Old Guard at Ligny were not covered in 'The Legion of honour' medals although paradoxically quite a few of them probably would have earnt it, as would many officers, but there is not really a way to get one unless you pin it to yourself. Maybe some sort of commitee should be formed and award medals to those making a great contribution to the hobby?